ወላ ካ ነዚ ጉዳይ ዝምልከት ርክብ ብመገዲ ፖሊስ ተተገብረ ናይዚ ናይ ሞት ፍጻመታት ግን ብኸመይን ስለምንታይን ዝብል ዝርዝራዊ መርመራታት ብመገዲ ምቁጽጻሪ ገበናት ፖሊስ ብዘይ ምፍጻሙ ቤተ ሰብ መዋቲት ንኣማዊታ ሰቦም ዝሚልከት ጽጹይ ሓበሬታ ኣምረካብ ኣብ ህንጥዩን ዘይዉሑሱን ትጽቢት ይርከቡ. Refugee Aktivist*innen berichten über ihre Kämpfe: Mit Oury Diallo, Kanha Chhun, Miloud L. Cherif u. a.
unserer Präsenz“ in jeder BLACK BOX erkennen. Alles hängt von uns ab. Das System schützt uns nicht. Lasst uns gemeinsam organisieren. outsiders. Everything left on the show goes to the voice of autonomy. Monday 11.3.2019 | 4:30 pm to 7:00 pm | Our Break Deportation Meeting takes place in Jena! Come along, discuss and organize – together against deportation and isolation! Montag 11.3.2019 | Zeit: 16:30 bis 19:00 | Findet unser Break Deportation Treffen in Jena statt! Kommt vorbei, diskutiert und organisiert mit – gemeinsam gegen Abschiebung und Isolation! Your Knowledge is your Black Box! Empowering the tools of our political struggle defines our actions Workshop@refugeeBlackBox – Fabrik in Eisenberg. All days events. Empowering the tools of our political struggle that defines our actions. Bring your Black Box and stay on board the Million X „Refugee Black Box“ Revolution: #undocumented_Refugee inquiry. speak out now! Your Knowledge is your Black Box! The refugee black box is a political tool to expose and protest the injustice with your hands, brains and hearts and in solidarity with the oppressed refugees‘ struggles. 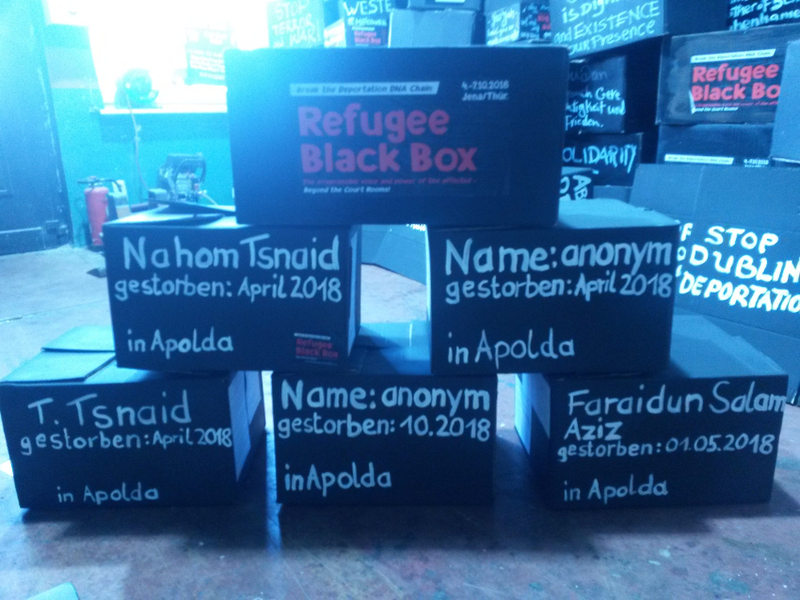 Join us to produce the Refugee Black Box and empower your box with statements on the crimes and violations on refugees and migrants rights: your cry for justice and against the injustice against the refugees. Your positions and demands will make part of the million X RefugeeBlackBox. Speak out! I speak, you speak, we speak and many many more people will speak in million x solidarity. Revolution can be planned! #SharingIsCaring! 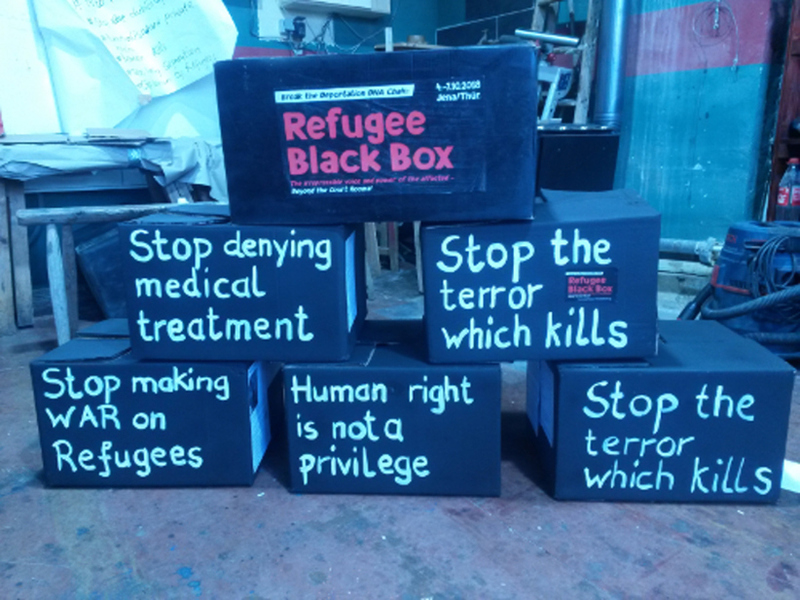 lt is time to ask for your donation: Donate to Refugee Black Box – Million X Revolutionary weapon of solidarity Refugee Black Box Solidarity is a powerful tool of our political struggle – nationwide and beyond. Against refugee oppression and repression, for justice and against injustice: Stop the deportation and colonial injustice! 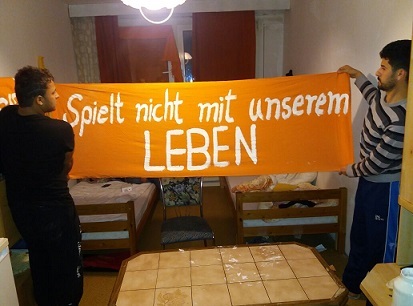 Compliments to Refugee Black Box activism in Sachsen-Anhalt, Berlin, Baden-Württemberg, Bavaria, Hamburg, Thueringen, Hessen, Northrhine-Westfalia, Niedersachsen.